Once again our school participated with schools all over the world to help break the Guinness World Record for “Most People Sport Stacking at Multiple Locations in One Day! A New World Record for STACK UP! A new world record for “Most People Sport Stacking at Multiple Locations” has made its mark for 2012. Thanks to the 483,658 stackers from 2,375 schools and organizations representing 30 countries around the world for making this year’s WSSA STACK UP! the biggest and best ever. At exactly 1:59pm MST on Friday, November 16th, last year’s record of 412,259 was broken with the help of the 620 stackers at J.Larry Newton School in Fairhope, Alabama. Verifications continued to pour in until all were accounted for and the final tally reached. If you would like more information, or learn how you can participate next year, please contact Mrs. Horowtiz. Click here to see more photos from this album. As part of our unit on issues in education, Deputy Chancellor Weiner visited AP Language and Composition. He gave students an overview of his role in the city’s Department of Education, discussing the changing methods of evaluating teachers. He got our students’ feedback on their own thoughts about teacher evaluations, and how to include student voices in the process. Students referenced our articles by Jay Mathews and Brent Staples that covered the role of grades in teacher evaluations, and the meaning of grades in education. Click here to view more photos of the visit. We are proud to have an exceptionally active and organized student government, which serves as a voice for the students and liaison between the school administration. Under the guidance of Ms. Marinos, our Social Studies teacher and Chair of the Social Studies Department, the student leaders meet weekly to discuss projects, proposals, and create action plans to fulfill their goals. Representatives from grades 6 through 12 work together to improve communication between the grades. Student Government is working hard on planning our first school wide event. On Friday November 30th (between 2:30 and 6:00), they will be hosting East-West first Hunger Games! 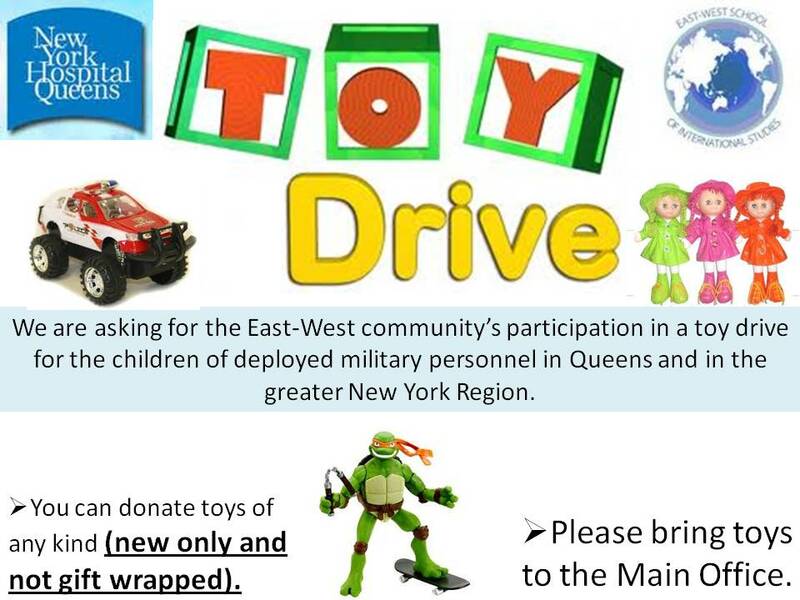 We are asking for the East-West community’s participation in a toy drive for the children of deployed military personnel in Queens and in the greater New York Region. All toys will be donated to FreeMAT (Freedom Medical Aid Team) a voluntary organization of employees from New York Hospital of Queens who have been collecting toys and personnel care items from Queens residents for the U.S. military since 2002. All schools will hold full-day sessions from Wednesday, February 20, through Friday, February 22. These days were previously scheduled as part of mid-winter recess. Elementary schools, intermediate/junior high schools, and D75 schools will hold full-day sessions on Tuesday, June 4, which was previously scheduled as a shortened clerical day for these schools. Please note these changes as you determine your plans for these dates. Additional information on the impact of Hurricane Sandy is available in an FAQ for families on the DOE web site, http://schools.nyc.gov/. Please contact your school’s principal or parent coordinator with any questions or concerns. As part of the United Nations’commemoration of UN Day on October 24, UN4U provided our students the opportunity to have an up-close and personal overview of the UN with a UN official, followed by a Q&A of what is happening in the world.